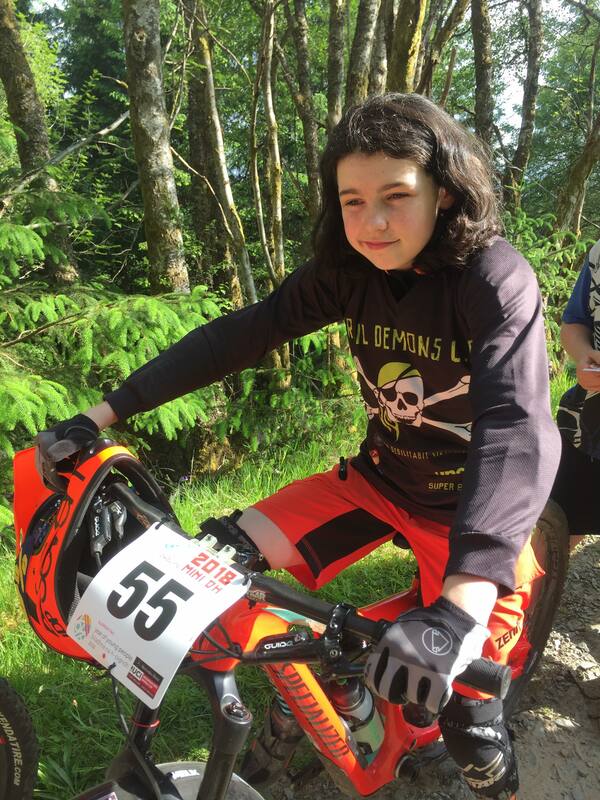 We were delighted to support Hannah at the Under 14 Girls Mini Downhill Mountain Bike race in Fort William. 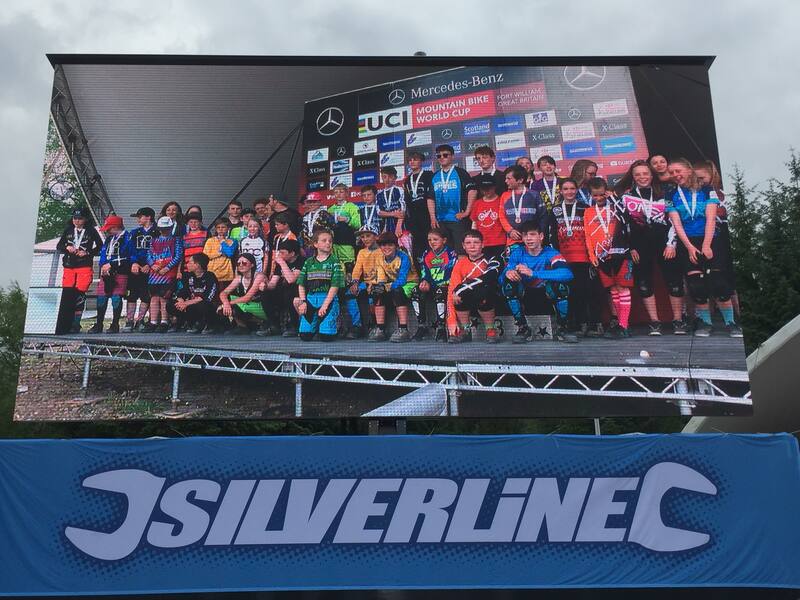 The mini DH race finals, hosted by Scottish Cycling, were held on the same weekend as the UCI Downhill World Cup. Read how Hannah got on in her own words. 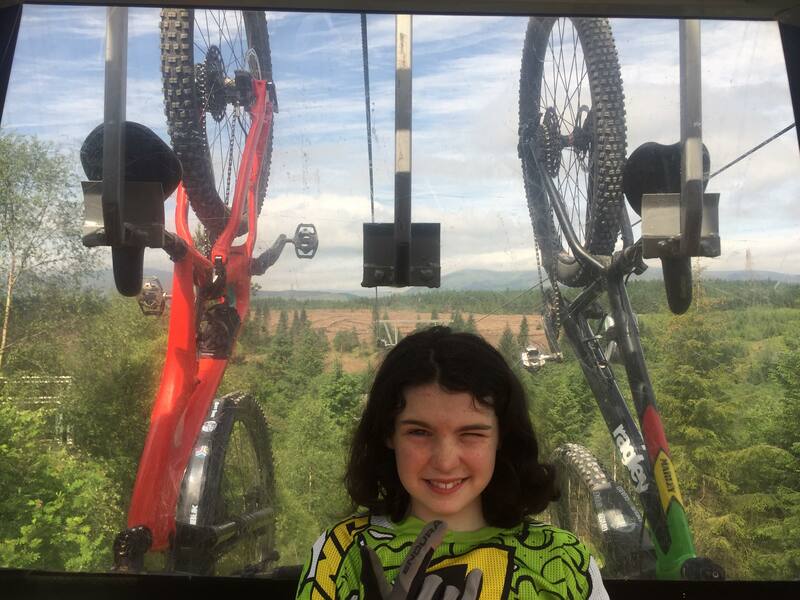 We arrived at Fort William World Cup race village early on 1st June to check out the Mini Downhill course and meet some of the pro-riders. We walked the course first to check out the lines and after a few practice laps I was ready to race it. The weather was great; it had been dry leading up to the race, leaving the course dry and dusty, but also fast. The nerves kicked in once I woke up, on the biggest race to date and only ever second downhill race! There were hundreds of people there. My family were there supporting me as well as friends from Inishowen and Lurgan. I got my race number (no.55) and was told I had to complete 2 practice laps before racing commenced at 10.30am. On the start line the adrenaline rushed throughout my body as I got closer to my No55 call! Helmet check complete and then Dad whispered in my ear “Good Luck Hannah!” Then “3, 2, 1…GO!! !” and I was off. All I could hear was the sound of cowbells and people cheering for me all the way down the course (It felt like we were the pro-riders). The atmosphere was amazing! The first run was done and dusted and it went well. I made my way back up the mountain to the start line once again feeling confident with my first run. I knew that to get a good result, I had to go faster. I was off again-dashing straight into a natural trail section, jumps, roots, drops and flowing through the berms, it was twisty, but fast, the noise of the crowd was amazing when I came over the last rock drop, it felt fantastic crossing the line to the sound of the crowd cheering. 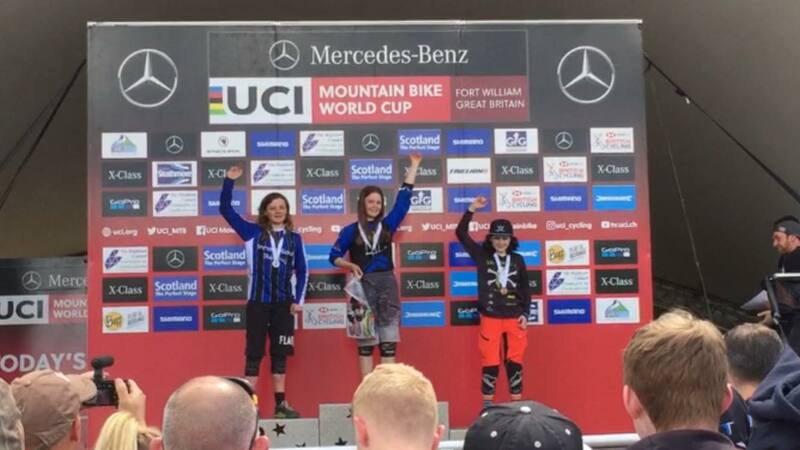 It was then prize giving, I was going to get on a “UCI DH World Cup Podium” I just couldn’t believe it. I waited behind the stage where the podium was, staring at an Orange Santa Cruz trail bike, owned by an absolute world class rider and a major inspiration to millions all over the world, Danny Macaskill! Nerves started running through my body as they called the names of the race winners to the front of the stage. Third place for Hannah in the U14s! “In third place…Hannah Mullin!” There standing with a third place medal in his hands was Danny Macaskill, It was Great to see big crowds clapping and cheering and was really encouraging. Then all the youth riders were called on to the stage for a group photograph with Danny. It was so cool! My hero Rachel Atherton took 3rd place the following day in the elite women’s race after snapping a chain at the start of her run. It was an unreal feeling to have shared the same podium position as her just the day before and to share the same step; this was the highlight of my weekend. 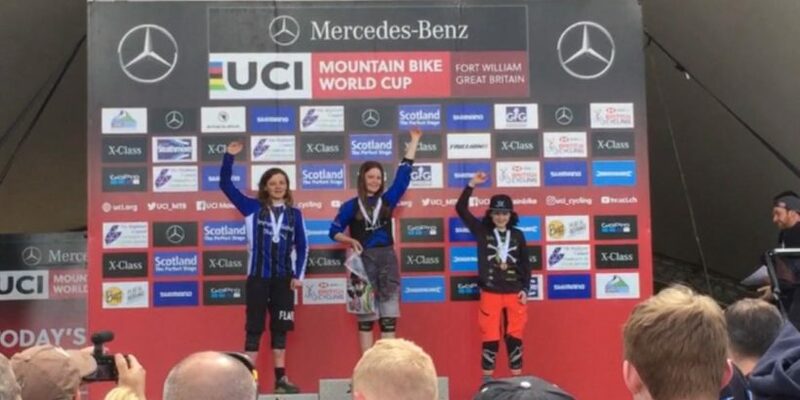 Fort William is a world class venue, it’s the longest UCI DH race on the calendar, we then completed the DH World Cup track on the Monday (but not the speed the pros did it). Thanks to Cycling Ireland and the Women’s commission for all their support for this race and all the encouragement for young female riders. Also a special thanks to Silvia Gallagher for the loan of a spare bike, and all your advice. Well done Hannah! Full results available on the Roots and Rain website here. 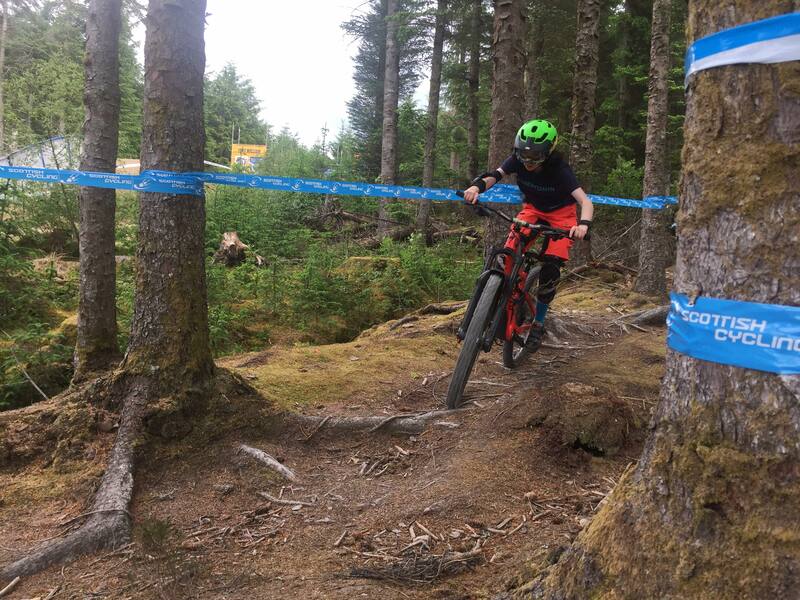 If you are interested in finding out more about racing downhill mountain biking, read our Downhill 101 here, or contact Silvia at women@offroadcyclingireland.ie. 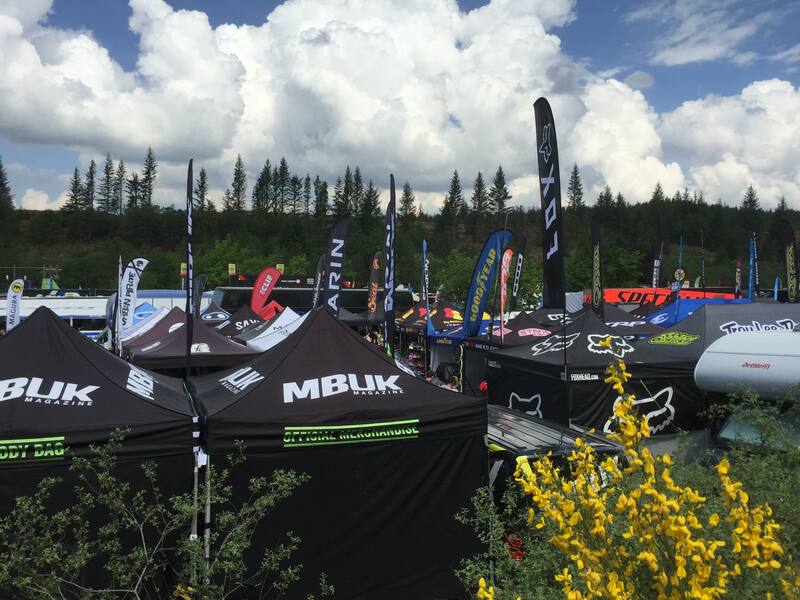 The next Downhill race is in Bike Park Ireland on the 21st / 22nd of July.